Browsing Category "Group Discussion in SSB"
Mostly asked GD Topic ~ Which is the biggest problem our Indian Army is Facing? Boys if you are going to attend your SSB interview in upcoming days then you must prepare this topic for your lecturette and group Discussion as it will cover three discussion i.s Jammu and Kashmir problem, North-East Problem and Naxals Problem in India. I have provided a separate post on North-East problem in India read that also. India is facing a number of internal problems. One of the major problem inherited since the days of partition is Jammu and Kashmir. As the years passed, the North Eastern states got into insurgency. Starting with the Nagaland in 1956, the problem has spread to Assam, Mizoram and Manipur. As these problems were not enough, a new challenge came in the form of Naxal problem. This problem picked up in 1967 and now it has engulfed 180 districts. Due to its magnitude, the killings, lootings and extortion, the problem has national dimensions. This problem started as Mahraja Hari Singh, decided to keep J&K, independent, as buffer state between India & Pakistan. Both countries have fought a number of wars during 1947-48, 1965, 1971 and Kargil in 1999. The Pakistan sponsored militancy also started since 1988-89. Pakistan, with the help of local and foreign militants wants to liberate J&K from India. India will never allow Pakistan this option. India has proposed to convert this line of control(LOC) into permanent border between India and Pakistan. Pakistan has not agreed to this proposal.. The solution to the problem should be acceptable to the Govt. Of India, Pakistan and people of J&K. the talks between both countries have been abandoned due to 26/11 attacks on Mumbai with political stability returning to both sides the political dialogue for peace may hopefully resume soon. The insurgency in Nagaland started in 1956. The armed Forces special Power act 1958 was enforced to give legal powers to Armed forces to carry out operations against the militants. Insurgency spread to Mizoram in 1980’s. Assam had its own problem after the creation of Bangladesh from where many people infiltrated and became Indian citizens. ULFA is fighting for a separate Independent Assam and all the foreigners to be thrown out from Assam. Manipur insurgency is the latest. The main problem is the ethnic entity and control of area along the Myanmar border to control smuggling and opium activities. The govt is having ceasefire with both the factions of Nagas since 1997. Talks with ULFA are expected because of a pro-India govt In Bangladesh. The army alongwith Assam rifles are trying to control the situation in Manipur. This is a socio-economic problem for the country. It started in 1967 from a village, Naxalbari in West Bengal. These people were poor peasant’s whose land has been merged with big landlords or money lenders. From west Bengal the problem has spread to Bihar, Jharkhand, Orrisa, Chattisgarh, Andhra, Maharashtra and MP. They demand economic reforms which will boost agriculture and industrial sectors. They want judicial reforms so that justice is prompt and cheap. One of the factors for growth of Nexal problems is lack of social reform. This has forced the poor problem, SC to join Naxal moment. Lack of development and poor governance have added to the existing resentment. Naxal are killing govt officials, looting banks, damaging govt. property to enforce their writ. The govt is trying to fight this menace by pooling resources, joint operations by the state and motivating the locals. All these problems have their own significance. The govt. can not ignore any of the problems. But Naxals problems which is spread to 1/3rd of India has become a major problem which govt. has to tackle at war footing. Who is responsible for crime against Women? AND What we should Do? Is it your SSB interview time now, then be prepared for some hot GD and Lecturette Topics like this, they may ask yor for a GD or Lecturette on crime against womens in India. Prepare for this guys from this post. Our civilization taught us to respect women. We have been taught from our child hood to respect our sister and mother. Yet newspapers are full of many types of crime against women. Headline of yesterday, news of today, two girls Nisha Sharma and Farzana stood boldly against the demands of dowry from their respective in laws. Saying no just before marriage has stopped the crime against them. Timely step has saved them. But what about all other Nisha Sharma and Farzana. A big question, who is responsible for crime against women. Male dominance is there but along with it there is lack of education and poverty. Women are themselves unaware of their rights and laws framed to protect them against different exploitation and crimes. Recent trends show that there is increase in the crimes, but on a positive note number of them have been stopped due to awareness and reports made to police. Human Rights Violation against women and also home violence is been taken up seriously. Government and NGOs are working to frame programmes and plan to deal with all these problems. In our country male has dominated the women throughout. The crime against women starts even before she is born. If the parents come to know that the child is likely to be a girl they plan for an abortion. She is discriminated in education and providing food and cloth. After marriage she is forced to change her name. She is physically abused and forced into flesh trade. A former Miss Bangalore who was arrested from a five star hotel is a latest case of male abuse of women, which made sensational headline. Earlier we lived in big joint families, the elders in some ways protected the women. However due to the concept of nuclear families coming in today we are now more exposed to crime. In our society the parents feels happy when a son tells them that he has girlfriends. But the same becomes hostile when their daughter tells that she has a boy friend. Every country has its own customs and culture. Of late others have influenced us. The women today wear Jeans and Skirts in a big way. It is primarily because they feel more comfortable in these dresses. Can you imagine today women running in sari trying to catch a DTC bus. But in smaller cities however the western influence is marginal. Moreover when it comes to marriage the most modem girls like to wear saris. In Western families the only precaution they take is that the girl should be careful and not comeback late in the night. They should be accompanied by parents & avoid strangers and excessive drinks. Our culture has taught us to respect women. Then how come when we see a girl in jeans and skirts we feel she is a loose-charactered woman. After the dowry cases in our country were reported w hen many women died, the government had made very strong rules and the culprits were also punished to death. Today the law says "no safai, no gawahi". If any dowry case is reported the culprit is straight away put behind bars. The Ex Police Commissioner of Delhi Police had once praised the Women of Delhi, who had come forward to report the crime committed against them. He said when these crimes are reported only then the govt & the parliament can make rules in support of the women & these rules will help 100's and 1000's of illiterate women who are not educated enough to report these crimes. No wonder our Home Minister is already talking ofgiving death sentence to the rapists. 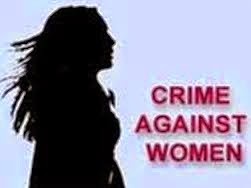 SSB GD and Lecturette Topic ~ Who is responsible for crime against women? 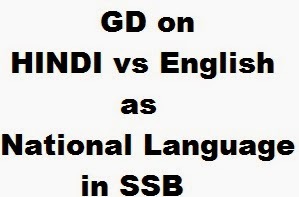 Hindi Vs English is very important topic in Debates in Schools, colleges and it may be asked in Group Discussion or in Lecturette in SSB Interview. This is multipurpose article you should read for your knowledge. The debate about making Hindi as National Language and English as Official of Link Language is very old. It started with the framing of our constitution. Under the British rule, English was the language of higher education and administration. After independence, the politicians in the North stated pleading that Hindi be made the Official Language of India, while those is South insisted on English to be continued as Link Language. The matter was discussed in the Constituent Assembly and a compromise formula was evolved. The official language of the Union shall be Hindi in Devanagri script but English shall continue to be used for all the official purposes for 15 years from the date of commencement of constitution. After the independence, Indian states were reorganized on the basis of regional languages. States in North India have Hindi speaking people. He states in East, West, and South have their own regional languages. The people in these states do not fully comprehend Hindi. Overall, majority of people in India speak Hindi. An independent country has to have its own national language. Since Hindi is spoken by the most of a people, the choice naturally falls on Hindi. It is well known fact that a person is capable of expressing best in the mother tongue. Since, most people in India speak Hindi, it is natural that Hindi be made the official language of India. The non-Hindi states can be encouraged to learn Hindi. Efforts have been made to introduce Hindi in schools of the states where it is not the mother tongue. The younger generations in these states are growing learning Hindi. In spite of the best efforts by the Central Govt. to propagate Hindi in the non-Hindi states, there has been a considerable resistance against its imposition. The opposition to Hindi in these states is expected to slow down with the passage of time. Hindi has a rich heritage and literature. It has successfully replaced English in the fields of Administration, judiciary and medium of instruction in Higher learning in some of the states in the North. Hindi can easily replace English as Official Language of India. English is the language, which is spoken and understood throughout India by the educated people. It can be better link language than any of the Indian languages including Hindi. English is already in use in India in higher administration, higher learning and higher judiciary. There is a widespread network of English medium public schools throughout the country. English is no more the language of elite, it is the language of all educated people who want to grow and excel in their respective fields. The main reason for the boom in Information Technology in India has been the availability of English speaking people. The young boys and girls could talk on telephone to American in their accent sitting in call centers in India. The Americans find it cheaper to outsource their Business Processes Financial Accounting, Legal documentation, Medical Transcription to India, because skilful people in India can work on these processes in English. English is language of Business, Science and Technology. It is spoken and understood all over the world. It is the medium of international communication. With globalization of our economy it has become necessary to retain English as the official language so as to interact internationally. At the same time it would be easier to communicate with different states in English. GD/LECTURETTE TOPIC IN SSB ~ HOW CAN THE IMAGE OF THE POLICE BE IMPROVED? Guys i have uploaded may GD and Lecturette Related posts earlier and this is also one of the important post that can be asked in Group Discussion in SSB or anywhere in your interview. So before proceeding for your interview you should have a look on this post also. In a society, where thousands of people live, differences / problems among individuals are bound to occur. These differences sometimes end up in crime from petty thefts to dacoities, to murder, to kidnapping and, more lately to cyber crime. The police is the most important government agency which maintains law and order. Hence it becomes of paramount important that the police force remain in healthy state. For any government agency to work effectively, training is an important aspect. If the training is lacking, the efficiency will go down. Every job has a peculiar training requirement. A policeman has to deal with the public and has long working hours hence the first and foremost requirement is that he should be mentally and physically healthy. Secondly, to take the criminal to a conclusive trial, he should be an expert at collecting evidence. Thirdly, he should be an expert in handling weapon and equipment because often situations arise when force has to bring the offender to the book. Gone are the days when Jaggu Dada was responsible of all crimes in a locality. Today so many people are involved in various kinds of crime that police investigations has become a very difficult task. Hence the need for modernization. The police today heavily banks on computers to store and record various kinds of data. They need proper weapons to incapacitate the offender. A water cannon rather than tear gas shells is better to break a hostile rally. They need a better and more reliable communication network. Lastly, they need swift and better transport to physically apprehend the culprits. The police also need the assistance of the doctor fraternity to prove crime. In our country, the public has a fear of the police. We are fed with numerous stories of the bad treatment/experience individuals had in dealing with the police. A few black sheep who exist in every department give a bad name to organization. Police all over the country is trying to improve its image. No wonder the Delhi Police has coined the slogan, “With you, for you, always.” Today, the SHOs of police stations are easily available and ghey brief the public on the latest situation of their case. Senior police officials hold public durbars where public grievances are resolved. On the other hand it is also the duty of the public grievances are resolved. On the other hand it is also the duty of the public to cooperate and give regard to the police personnel. Public encouragement will motivate him to perform better. A better Police-Public relation will go a long way to clean the society. The emphasis should be on crime control through people’s participation and fear of uniform must be removed. Instill a sense of security amongst the people and senior citizen. Police officers must patrol beats. Emphasis must be to crack down even petty crime to show who is in control. Effective police personnel must be rewarded. topic in deapth. 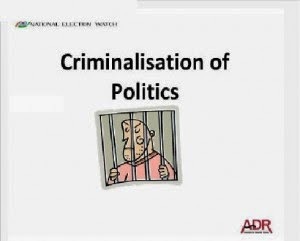 I am providing a basic view of Criminilization in Indian Politics. India is the largest democracy of the world and our public is politically aware of its rights. Election time always generates hectic activity in the society initiated by the political leaders to businessmen to film stars all trying to win votes. As G.B Shaw had said " Democracy is a social order aiming at the greatest available welfare for the population and not for a class". But it is also said that Politics is the last refuge of Scoundrels. India is the largest, working democracy in the world, which in its constitution has incorporated from every best constitution, of the world. The thing, which goes against India, is Population, Illiteracy and Poverty, which is being easily, exploited by the mafia as they find safe refuge. So Election Commission has to play an important role. The general public should be very well aware of the Candidate's past record, his and the party's agenda. People should have good knowledge about how to use the ballot paper and should be aware of the symbols of all political parties. The election commission should make adequate steps to make authenticated Voter's I-Card and put the names of eligible people in the Voter's list. They should ensure that all members of the family must give their valuable votes. Seniors must ensure the names of all members who have attained 18 years of age in the electron polls. In rural areas where the electronic machine is not accessible to the villagers, it must be ensured that whosoever gives their vote. The blue erasable mark should be properly be put on their finger. They should also explain the people how to fold the ballet paper and to put it properly in the Ballet Box, so that the ballet paper is not crushed. The Ballot Paper, Electron Roll should be properly scrutinized. Voter Card should be issued to stop bogus voting. Clear demonstration of voting machines should be held in every nook and comer to the country. Voting Rights to the candidates has to be explained to them. The Agenda of the party has to be aired on TV and Radio so that the people are aware of the developmental action to be undertaken. Strict Vigilance of the election should be there. Commission should be set up. Presidential Rule should be involved when they are going disarray. Political parties should be stopped from dictating terms and interference. Election Commission should have trained staff, and from time to time should train the new staff also for smooth conduct of elections. Along with effective training Security of these officials has to be undertaken so that they don't get insecurity feeling. Bills should be passed for funds and donations of political parties. So they, the mafia can't pressurize the parties for their cheap politics. Results declaration has to be made electronically speedy. Supporters should be kept out of voting area, so that they cannot influence the results. The head of the political party should lay certain strict guidelines especially for the elections so that they may keep an eye on how the funds are sanctioned and in what ways the money is used. Election Commission has to make it a point that people having a criminal background or people against whom there are court cases should be debarred from filling nomination papers for tickets. Tickets have to be given to only those candidates who possess a good character with clean and good educational background. Young People should also be given a chance to show their potential that can act as "Fresh Blood" in the veins of Indian Politics. (For eg Omar Abdullah and Jyotiraditiya Scindia). The aim of the political party should be to provide good clean government to the Country/State and not to 'come to power only to serve their own personal interests. Why is crime increasing in our society? Who does the MNC's help the most? Now a days we face various problems related to exam paper Leaks in India and problem faced because of it, this post is related to Reasons for exam paper leaks, this is important topic can be asked in Interview or in Group Discussion. We have heard of scams and rackets like Bofors, Chara Ghotala, Stamp Papers, and Tehelka Scam. All these scams and scandals have indeed shaken the faith of common citizen of our country. There had been talks of corrupt practices in educational institutions for quite a long period. Various cases of leak age of papers and other malpractices in schools and colleges have been reported in the past. But the system and the dragon of corruption and unethical practices have eaten up the machinery like mite. The problem that needs to be addressed is the leakage of important question papers one after another of prestigious exams like the CBSE-PMT, CBSE board and CAT papers etc. it is a cruel joke with the future of the deserving candidates. It leads to dissatisfaction and apathy for the system amongst them. It is an evil in our society and a blot as far as Indian system is concerned. So is it the parents, student, or system or a nexus of all the three responsible for the evil? Who is to be blamed? Parents want the best for the children and some parents want to fulfill their aspiration through the children. If a child is intelligent he finds his way and settles down in his career despite stiff competition. But what about the average students? For example. A doctor who runs a nursing home will like his son to join him as he needs more hands. When he realize that his son cannot become a doctor on his own he is tempted to short circuit the system. Ranjit Don and Verma, the brain, behind the various paper leaks, have revealed some of the rich and famous parents who were willing to pay 15-20 lakhs to secure a seat for their wards in prestigious college and institutions. The point is that rich and famous parents are more prone to indulge in these practices purely because they have a high paying capacity. In the bargain, parents and students of average financial background suffer. Parents must understand the capability of their child and groom him according to his talents and capabilities. The emphasis must be to develop a well-balanced personality to become a good citizen. Going again the capabilities of a child is like filling a square peg in a round hole. There is tremendous pressure on students to excel and make their family proud. The pressure from within the family and success stories of peer group influences the mind of the child. The success rate of most competitive examination is 0.2 – 0.3 %. The wastage rate is very high and a child is in a catch -22 situation. Despite putting hard work and spending his parent’s money in coaching institutions, when a child does not make the grade he gets a wee bit dejected and gets impatient to find an early solution to his problem. This is the age, stage and time when he may get tempted to approach brokers to assist him in climbing the ladder of success. The parents must watch, guide and motivate their child at this juncture of their life so that they do not falter. The fruits of success earned through labor are sweet. Someone had rightly said an easy way is simple to find but does not go far. A difficult way is hard to get but takes you fair. A system is made by competent authority to give an equal platform and playfield to all concerned. Our education department has drafted watertight system for conduct of various competitive examinations. However from time to time this system is penetrated and it needs revision. Earlier, only one paper was made for a certain competitive exam. When reports were received on mass copying, the system made 4/5 sets of question paper so that two students sitting on adjoining table in an examination hall did not receive the same paper. When reports of impersonation were received the candidates, photograph was embossed on his admit card.